John Wooden, UCLA Mens Basketball coach from 1948-1975 and winner of 10 National Championships, said that “Success is peace of mind which is a direct result of self-satisfaction in knowing you did your best to become the best you are capable of becoming.” I love this quote for many reasons but perhaps the most important reason is that the emphasis is on the individual commitment to work to the best of one’s ability and not defining success according to popular definitions. Some popular definitions of success may be how much money you make or how many A’s you get or how many points you score in a game. Rather, Wooden and our own faith tradition reminds us that true success lies in how one lives their life. For us then, how do we view success? What lessons of success will we pass on to our children? I sincerely hope you will join me in sharing a vision of success that encourages our children to continually grow in their capacity to become the person that God wants them to be. In doing that, we work towards our mission to raise our children to be Saints. 1. Re-registration will happen on February 6, 2019 following our AGM. The AGM is at 6:30pm. All families need to attend the AGM. As soon as the AGM is over, we will have tables set up to accept re-registration packages. It is very important that you bring all your re-registration forms filled out and required documents already copied. There will be a $20 administration fee for late re-registration packages received after February 6. 2. All parishioners of St. Jude Parish will need to have Fr. Jun sign a form indicating that they are to receive Category 1 tuition rates. This form will be in the registration package for those who are parishioners of St. Jude Parish. 3. We have added a Category 3, which is in alignment with other Catholic schools in our Archdiocese. Category 3 is for those families who are Non-Catholic. Our 3-Way Conferences are scheduled for January 24, 2019. Similar to our Parent-Teacher Interviews, we will be using an online platform to schedule appointments. Please be advised that students need to attend the conference with their parent(s) and they need to be in school uniform. Please click here to sign up for your time slot(s). Our Scholastic Book Fair is coming! During the week of January 21-24 students and families will be able to purchase books! Please click here to read more about the Scholastic Book Fair! Krispy Kreme Doughnut Sale will take place on Friday, January 25, beginning at 11:45am. Pre-orders can be picked at this time. Please come out and support the Grade 7 class!! For our next Care Day, on Jan. 25th, we are going to brighten up these dark, dreary winter days. Wear the brightest colours you can find, to support Chalice Canada, a Catholic charitable organization that “works in impoverished communities to help struggling families overcome the cycle of poverty”. Don’t be gloomy – bring in a toonie! It’s gonna be a bright (bright), bright (bright) Care Day! Please click here to read about a parenting workshop about taking the stress out of parenting. What an amazing and fun day of basketball today for the gr 5/6 girls team. 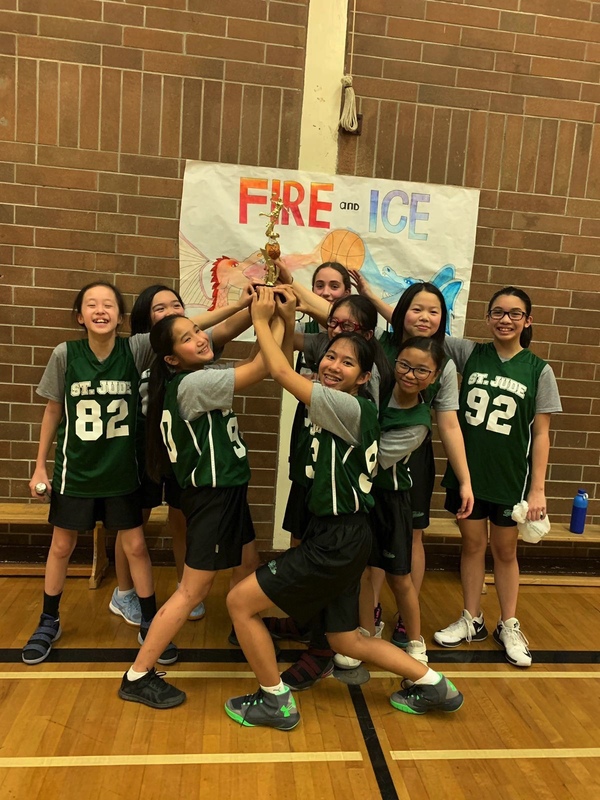 The girls played hard against St Francis of Assisi at lunch, winning their game and ended the day with another victory against St Mary after school. Well done girls! On January 15th, the Grade Seven girls attended the inaugural SFDS tournament. 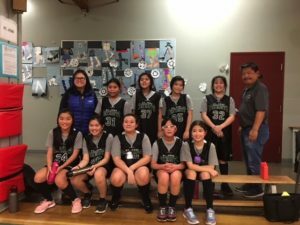 We played against several teams, including St. Matthew’s, the home team SFDS, and finally St. Catherine’s (where the ever-awesome Mr. Penaso now teaches). After mastering some team plays, lots of hard work and perseverance, we won all of our games…. and found ourselves in the finals, in which we played for the championship. In the finals, we were playing against St. Catherine’s. This game was very intense and the score was close, but we managed to overcome our fear of the opponents, and captured the championship! As a team, we’re very proud of what we accomplished, and we would like to thank SFDS for the opportunity, for inviting us to their tournament. We also want to thank our wonderful team of coaches, Miss Smillie, Mr. Ancheta and Mr. Akol. As mentioned, seeing that this was their first tournament, we made history by being its first-ever champions!